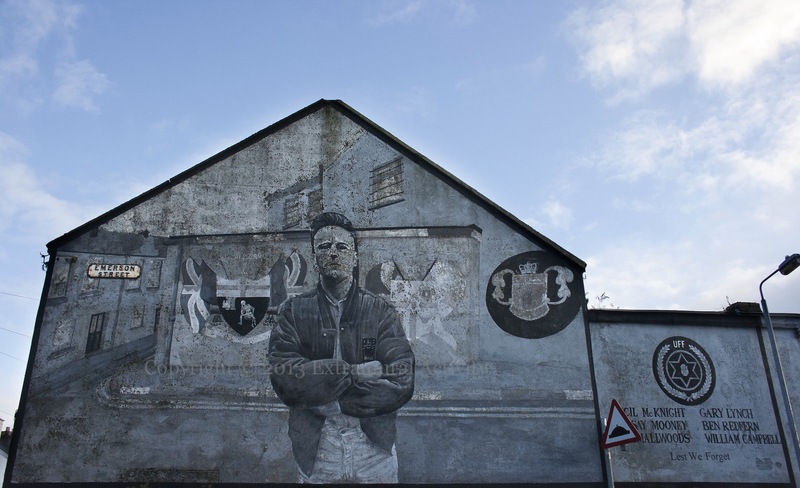 A mural in Emerson Street, London-/Derry/Doire, featuring UFF/UDA volunteer Cecil McKnight and additionally naming Lindsay Mooney, Ray Smallwoods, Gary Lynch, Ben Redfern, and William Campbell. McKnight is shown standing in front of a mural in the adjacent Bond’s place circa 1990 (facing the Trooper mural). The Londonderry crest (left of centre, over McKnight’s right shoulder,) is featured in the mural in Vita, Veritas, Victoria.